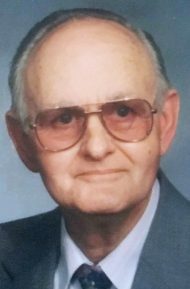 Jay E. Charles, 93, formerly of Millersville, passed away Monday, March 18, 2019, at Country Meadows, Lancaster. Born in Manor Twp., he was a son of the late David G. and Esther (Ament) Charles. Jay was the beloved husband of Mildred (Hess) Charles, and together they celebrated 73 years of marriage this past December. Jay attended Penn Manor High School, and later as a member of the US Army, he honorably served his country through the end of WWII. From 1959 through 1973, he worked as a Quality Control Inspector for the RCA Corp in Lancaster. He also worked for Trojan Yacht and operated his own painting business. Jay was an avid deer hunter and trout fisherman, and was a member of Camp Lookout Hunting Club in Renovo, PA. He enjoyed playing guitar and singing with gospel, country and blue grass music groups. A devoted Christian, Jay loved the Lord. He was a longtime member of Central Manor Church of God, Washington Boro, where he served on church council, choir and male quartet. In addition to his wife Mildred, Jay is survived by two daughters, Elaine Johnson and her husband Richard of Cohutta, GA, and Judith Ann Sollenberger of Ironville, PA, and a son, D. Scott Charles and his wife Heesoo of LaMirada, CA. Also surviving is a brother, D. Alvin Charles and his wife Grace of Central Manor; 5 grandchildren and 9 great-grandchildren. In addition to his parents, he was preceded in death by a grandson, Justin Johnson, and brothers, J. Robert Charles and Carl L. Charles. Funeral services will be held at 11 AM on Saturday, March 23, 2019 at Central Manor Church of God, 387 Penn Street, Washington Boro, PA 17582, where a viewing will take place beginning at 10 AM until time of services. Interment will follow in Laurel Hill Memorial Park, Columbia. Memorial contributions in Jay’s memory may be offered to Central Manor Church of God at the above address.